This entry was posted in Festivals, Fund-raising, Gigs, Workshops, World Music & Arts events and tagged african drumming, Bognor Regis, Claude Bourbon, West Sussex, Workshop on August 12, 2011 by nyodema. Nether Green Infant School in Sheffield raised £234 last Christmas to help Jeddah Progress Nursery School for 4-7 year olds in Brikama, The Gambia. The funding is being used to start a vegetable garden in the school grounds. The garden will help to improve children’s nutrition in the community. This area of Brikama is very poor and a typical daily diet normally consists of rice, sometimes with some peanut sauce or perhaps a little fish or meat but very little vegetables or fruit. The project has now commenced in preparation for this year’s rainy season. All the equipment and tools necessary to fence and dig the garden have been supplied to the school. Planting and cultivation will start in June, the time the monsoon rains begin. This summer they will be growing onions, carrots, cabbage, lettuce and root vegetables. Following the supply of desks and benches to the Gambian School funded by Renishaw plc based in Gloucester last year, Chris Thew and the team at Woodthorpe Community Primary School have raised an additional £600 to go towards school improvements there. The remaining 4 desks and 16 benches that were needed at the Gambian school are being supplied this month and the classroom floor is being concreted to improve the environment. The remaining funds have helped towards this year’s mosquito net distribution to the new intake at the school. Malaria is still the biggest cause of infant mortality in The Gambia. Mosquito nets are used worldwide in malarial zones and are a proven method of reducing deaths from this mosquito borne disease. Woodthorpe has funded half of the 115 insecticide treated nets distributed by Nyodema at the school in April. Since Nyodema started distributing nets to the school in 2007 the number of cases of malaria has noticeably reduced. Insecticide treated mosquito nets cost approximately £5. If you would like to make a donation to future net distributions, please send a cheque made payable to ‘Nyodema’ to Shelagh Hamilton, Nyodema Treasurer, Sunnyside, 1 Park Road, Bognor Regis, West Sussex PO21 2PX. Please state that the donation is for mosquito nets. Nyodema and the teachers and pupils at Jeddah would like to thank both schools for their generous support. This entry was posted in Fund-raising, Health and Education Projects in The Gambia and tagged Brikama, Mosquito net on November 18, 2010 by nyodema. 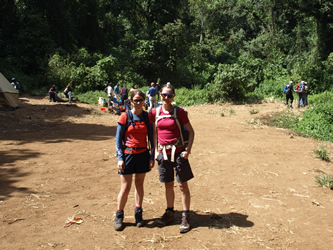 In August Hannah Braye climbed Mount Kilimanjaro in memory of her friend Lucy and raised over £1,000. This will go to help the school in Dairuharu and the first classroom being built will be dedicated to Lucy. 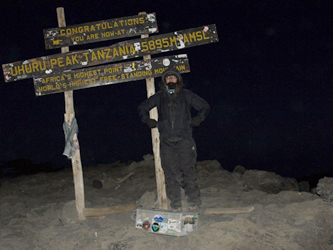 Following is a fascinating account of Hannah’s climb. Her determination is a real inspiration and I’m sure Lucy would be very proud of her. So today is the first day of our Kilimanjaro trek. 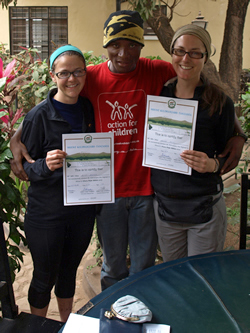 Alice and I met our guide Emmanuel yesterday evening (we are the only two in our walking group). He is 26 years old and has been walking the mountain since he was 17, working his way up from porter to waiter, to cook, to assistant guide and finally guide. He seems lovely although his English isn’t great. Alice asked last night at our meeting what would happen if one of us got very sick on the mountain. Emmanuel’s response was to say, “no worries, you make yourself sick, then you will feel better” followed by...”ok goody goody” (a phrase we will become very accustomed to over the next week). Not entirely filled with confidence by this medical advice we are a little apprehensive as we start to trek today. It is only really now that it is sinking in that I do actually have to walk up the mountain rather than just talk about it! We set off early from the hotel. The starting gate for the Lemosho route is the furthest away being a 3 – 4 hour drive. We pile into the jeep with our guides and driver and also two French speaking Canadians Alex and Matt, who will be doing the same route as us. They have the option to take an extra acclimatisation day if they want to and so we have separate guides and porters etc. It is ridiculous how many people it is going to take to get us up the mountain. It takes 3- 4 porters each to carry the tents and food, a cook per group plus a guide and assistant guide! The jeep ride once we get into the national park is extremely bumpy. I am sat in the back seat; there are only a few inches between the roof and my head, which takes quite a beating. How Alice manages to drop off for a cat nap is beyond me! From the gate where we sign in we can make out Mount Meru’s peak hazy in the distance. Many people walk Meru as a warm up to Kilimanjaro as it is 4566m above sea level and so can help with the acclimatization. We drive past the local potato farmers who are collecting in their crop and finally alight at the foot of the rain forest in the early afternoon. This is where our adventure begins. The walk through the rain forest is fairly steep but we take it “Poley Poley” (slowly slowly). At times the pace seems almost ridiculous but Emmanuel tells us it is the best way for us to acclimatize. At one point I compare it to a nice stroll, however Alice puts her foot down at this and states that she could not take her mother on this walk and therefore it cannot technically be a stroll. The mother benchmark is one we will use often over the trek to gauge the gradient and difficulty of the days walking. In any event, I enjoy the opportunity the pace gives us to look around and appreciate the amazing trees that arch around us and the tiny wild flowers that grow sporadically throughout the jungle. After about 3 hours walking we reach Mti Mkubwa Camp (known as Big Tree Camp due to the large tree in its centre that we camp around). We are concerned that Emmanuel may be slightly concerned to find himself in charge of two girls that seemingly chatter non-stop and ask endless questions, but already it feels like we are starting to get to know each other’s sense of humour and my confidence in him is growing rapidly. As it gets dark we are called to our mess tent for popcorn and hot chocolate. When we go inside it looks like the table has been set for a romantic meal for two! We tuck in and this is when I learn the first lesson of camping in the jungle….don’t drop food on the floor. As we eat our way through the popcorn I spit the hard unpopped bits onto the mud floor of our mess tent. Big mistake. Alice jumps up screaming, something is crawling up her leg and has bitten her. We shine her head torch down and see that giants ants are crawling their way over her socks and in to her trousers. I find this hilarious, until I look down at my own feet and see my trainers have also started to move. On the floor next to me a huge row of giant ants are devouring the left over popcorn. We have a real infestation problem. These are not your average ants. They seem to have super strength when it comes to hanging on to your socks no matter how hard you flick them. The Velcro on my trainers doesn’t help much! We decide there is nothing for it but to hot foot it over to the Canadian’s mess tent. They seem fairly pleased to be released from their own romantic candlelit liaison, although we’re not sure if they believe us about the severity of our ant situation and think they may believe us to have amorous intentions towards them! We decide this is not a problem as long as we don’t have to return to our mess tent and the four of us agree to eat all our meals together for the rest of the trek. The amount of food we are served is unbelievable. Soups, mountains of rice, beef curry and sweet bananas for pudding. We will certainly not go hungry on our trip. I head to bed we’re camping at 2750m so I’m sleeping in my thermals already. After a last loo stop I head back to the tent and unzip the door ready to climb in. Two dark shapes turn over and I realise I am in the Canadians tent! This is not going to help with their impression that we have amorous intentions towards them. When I finally locate the correct tent I sleep well but dream of ants for most of the night. The day starts with breakfast of a similar size to last night’s dinner. The porridge is a particular challenge. Tanzanian porridge is brown and very watery the oats have been completely ground up. It tastes of little until large dollops of Tanzanian jam, which is as sweet as opal fruits, are added. The porridge will become a daily challenge for some of us. It takes Alice 3 days to pluck up the courage just to try it. Before we set off the porters of an American group also staying at the camp sing a song about the mountain. It is a song that Emmanuel will sing to us many times as we walk. Some of the lyrics are Akuna Matata (which means no worries in Swahili, as most of you will know from a certain Disney movie about a lion cub). I actually prefer the porter’s song to Elton John’s. Our walk continues through the jungle. Sometimes an armed guard is needed as big game can still be found here. However as it is high season we are told the animals stay away from the trails, but we keep a close look out all the same. The trees as we get higher are amazing. Their leaves look like pale green cobwebs hanging from the branches. As we head higher the rainforest stops abruptly and turns into alpine forest. The trail is narrow and head high plants grow on either side of us. Now we are out of the forest the sun is hot and trail becomes increasingly steep. Emmanuel points out some of the shrubs. My favourite is the Protea which is the national plant of South Africa. As we climb higher and higher, we can see for miles down across the national park. We talk to Emmanuel about our lives in England and his in Tanzania. He is interested to know at what age people usually get married in England. He is 26 and at the age when men in Tanzania are expected to settle down (usually with a bride of about 18). However he says he finds it difficult with his job as a guide. During the high season he can spend 2 – 3 weeks of every month on the mountain. He says he must sort his life out before he can get married. It’s funny as I have heard many of my friends at home express similar sentiments. We walk for about 4 hours and as the path gets dustier and steeper I put my camera away in my back pack. Of course a minute later we round the Shira ridge and against the perfect blue sky we catch our first glimpse of Kibo, the Kilimanjaro summit, its white glaciers glinting in the distance. The last hour of the walk is flat across part of the Shira Plateau. This used to be Shira Mountain but when the volcanoes in the area were still active and erupting the mountain collapsed creating a perfectly flat plain, which stretches into the distance almost to the base of Kibo. The terrain has changed abruptly again. It is now moorland with spiky flowers and heather growing in abundance. After dinner we come out of the mess tent, the stars are so bright above us and illuminate the summit. It is so cold however that we can’t stay and look at them long and have to run to our tents. I end up in the Canadians again by mistake! I seem to be developing a real problem with tent location! At this altitude even just turning over in your sleeping bag gets you out of breath. This coupled with the 4 ½ litres of water we have drunk during the day and the diamox tablets we are taking to prevent altitude sickness (the main side effects of which are tingling hands and feet and an inexplicable need to wee continuously) makes for a broken nights sleep. At about 2am I have to go out of the tent to the loo. The chemical toilet does not smell good and the long drops are quite far away. I decide the only thing for it is a quick wumpy jeff-off round the back of the tent. Strangely the wind has dropped and it’s not so cold anymore. I put my head back and look at the stars. It’s the most beautiful wee imaginable. Today we are doing an easy walk for 3-4 hours across the plateau. It is one of the acclimatisation days built into our route to give us the best chance at reaching the summit. The plants in the moorland are beautiful and Emmanuel laughs at how many photos I stop and take. He calls the camera my baby. As we head further across the plateau, large almost tropical like cactuses are growing. They seem so out of place against the rocky snow covered summit in the background. The sun is very strong today and Alice and I both start to burn despite using factor 40 sun block. As we near the edge of the plateau we realise why. We are above the clouds! They stretch out below us, soft, white and fluffy, the kind that you just want to roll around in. I remark that it’s like looking out of an aeroplane window. Emmanuel is intrigued to know whether planes have windows and whether you can open them. He says he hopes to fly someday. We discuss some of the places he could go and suggest England, although he seems unsure about the weather. It’s a bit of a reality check given how much we take just getting on a plane and hopping to another country for granted. I really hope he gets to fly one day. We camp at Shira 2 which is right on the edge of the plateau at 3850m. The clouds are below us and the summit is looming ever present behind us. I’m really glad we did this route. We are pretty much the only group camping here and it’s been so nice to be on a quiet route. After lunch Frank our assistant guide takes Alice and I for an acclimatization walk for an hour to a camp just over the ridge. We can see the summit of Mount Meru again in the distance. On our way back we see an armed ranger. He tells us not to worry, he is protecting us. When we ask Frank from what he explains that sometimes Buffalo come up onto the plateau and there are wild dogs and jackals. I will have to keep a better look out during my midnight loo trips! After a brief nap I wake just in time to see the sun setting into the clouds. The sky turns from a yellowy orange to a dusty pink and purple. It stretches out all around us for 360 degrees, only broken by Mount Meru in the distance and the silhouette of the summit behind us. Dinner is as huge as ever. There is literally enough rice to feed 10 people. When we don’t manage to finish it our guides worry that the altitude is affecting our appetite and tell us we need to eat to keep our strength up. Apparently 4 porters would devour the entire plate of food in minutes. We try to explain that it isn’t our appetites; we just wouldn’t be able to eat this amount of food, whatever altitude we were at! Tonight I finally figure out how to use the toggles on my sleeping bag and I sleep toasty warm for the first time, although I still have to wear a ski mask to keep my nose warm! Today is a harder days walking. We are ascending to 4600m before dropping back down to 3850 to camp, as this will help us to acclimatize. As we climb steadily higher the moorland fades out into rocky terrain with large boulders scattered about and not much growing. We walk steadily uphill for 4 hours until we reach the lava tower, which we have lunch below. Alice isn’t feeling well with the altitude at this height and it is a bit of a wake up call that this isn’t just a lovely little walk we are doing. The lava tower is a 100m higher column of red/black lava rock, which was shot out of Kilimanjaro when it erupted in the past. At lunch the Canadians tell us that you need ropes and a climbing certificate to climb it. I’m therefore surprised when Emmanuel offers to take me up after lunch but I say I’ll give it a go. Alice has asked me to say that she valiantly stayed down at the bottom to take a photo of us at the top, so that is the story I am sticking to. Emmanuel and I nip round the side of the rock and begin to scramble up the side. Luckily I had some good practice on Llwedd when I walked Snowdon on one of my training walks, but this is taking it to a new level of rock climbing. I have my cap on so can’t look upwards and force myself not to look down, concentrating only on the piece of rock in front of me. At this point a guide from a different group sits next to Alice. When she tells him we have gone up the tower he helpfully tells her, “oh yes it’s very dangerous, if you slip you will certainly die”! But Emmanuel helps me over the tricky bits congratulating me with his trademark phrase “goody goody” when we reach the top. Alice is tiny below us and I can see all the way back to the plateau behind us. Alice manages to recover from her altitude/worry induced panic in time to take these photos of us at the top. Once we are safely back down we walk along the base of Kibo. We joke to Emmanuel that maybe we should just run up the side before dinner. He thinks we are serious at first. We descend steeply for about 2 hours and the environment changes back to an almost tropical alpine rockery as we walk down the stream running into the valley to Barranco Camp. As we walk Emmanuel teaches us some Swahili. His favourite phrase is ‘poa kachizi coma dizi’, (pronounced porky cheesy camondeesy). This translates as ‘super cool like crazy banana’. We think something maybe lost in the translation! We teach Emmanuel ‘easy peasy lemon squeezy’ in return – something I come to regret on summit night when, whilst I have my head between my legs in an attempt not to pass out, Emmanuel insists the walk is easy peasy lemon squeezy! My favourite Swahili phrase I have learnt so far is ‘la la salama’ which means sleep well, which I certainly did that evening after the exertions of the day. One of the strangest effects of the altitude are the crazy dreams that you have. The sleep is much lighter and I find I am having 3 or 4 memorable dreams a night. The night before last I dreamt that I was buying art from Mr Burns off the Simpsons. As you can imagine it was a hard negotiation but after the price was agreed, he did sponsor me for the trek so maybe he isn’t such a bad guy after all. Last night I started off as a small slightly plump woman with short hair but somehow managed to change bodies with Angelina Jolie, which was great. As you can imagine Angelina wasn’t so happy about it though! The start of today’s walk was not so much of a walk as a climb up the cliff face opposite camp. The fact that there are no photos of this part of the trek is testament to how steep the trail was. My camera was safely tucked away in my backpack for fear that I would smash it on a rock as I climbed or drop it over the edge. Alice’s mantra for most of the climb was “just don’t look up”! How the porters managed it with their loads precariously balanced on their heads and shoulders is beyond me. The rest of the walk is up and down, up and down for about 3 hours. We climb to 4200m but descend to 4100m to camp at Karanga, which in Swahili apparently means peanut. It feels like we are camped on the edge of the world. Alice and I have the last tent on the site, overlooking the edge. Unfortunately after lunch Alice isn’t feeling well with the altitude again so I play cards with the Canadians and their guide Living. Living teaches us the game that all the porters play in their tents in the evenings. Emmanuel and Living have a bit of a competition going on between the two walking groups. Who is winning at any given time will vary depending on which one of them you ask. However Living confesses to us during the game that the cards he uses with the porters are his and he has marked the Jokers, which automatically add 50 points to the score. Just as dinner is being served in the mess tent the sun begins to set and I manage to run to my tent and get my camera in time to take these shots. As we are camping higher than we have before the wind is much stronger. Most of our tents don’t have any pegs and the porters use large rocks to pin them down. During dinner the mess tent takes a real battering and it feels at one point like it might actually be blown off the mountain. A miniature dust storm swirls up around us from the floor and our food becomes all of a sudden crunchy. We each hang on to a corner of the tent with one hand and a pole/plate/table or whatever we can get hold of with the other. It is at this point that Matt decides to break into a rendition of Gloria Gayner’s ‘I Will Survive’ at the top of his voice which sends us all into hysterics and bowls and plates flying. After dinner on our way to bed Alice and I notice that the clouds below us have disappeared and we can see the lights of Moshi twinkling in the distance. It’s the first glimpse of civilisation we have seen for 5 days. Being on the mountain can almost feel like being in a different world. I awake to the sound of a white collared raven clucking round my head on the other side of the tent. I realise that it is trying to steal my silver coloured walking pole but it’s too heavy for him to drag away. Last night I dreamt I reached the summit only to find that all my friends and family were already there waiting for me! I was a little peeved that they had managed to beat me to the top but quite enjoyed the welcome. My mum and brother were running around up there all excited and trying to convince me to sledge down into the crater. I had to reprimand them like small children. Today is only 3 hours walk up to 4600m as we need to rest in the afternoon for the summit attempt tonight, although the trail is quite steep. Barafu means ice in Swahili, which is extremely fitting. There aren’t many redeeming features to Barafu. The wind is biting cold and so noisy. The terrain is like being on the moon, thick dust swirls into the air and is constantly in your eyes and throat. Even the ravens don’t inhabit Barafu. The wind is so strong our toilet tent stands no chance of staying upright and the long drops are positioned right on the edge of an exposed ridge so that the wind howls under the tin roof and a blasting ice draft blows up from underneath you. There is however a beautiful view of the neighbouring mountain. It is also over 5000m but it is a technical climb so not many people attempt it. Its peaks look like the turrets of a castle and it reminds me a little of Tryfan in North Wales. At our early dinner we stock up on carbohydrates and I think the nerves start to show on everyone as we prepare for summit night. We go to our tents and attempt to sleep but at this altitude and with the wind shaking the tent continuously around us I’m not able to drop off. If I reach the summit I will already have been awake for 24 hours. We gather in the mess tent at 11pm for tea and biscuits. Alice and I polish off an entire bar of dairy milk in preparation for what lies ahead. One might have thought that I was fairly prepared for the summit. I had fared well so far, not suffering with any symptoms of altitude. I had taken double the dose of diamox to the previous days, as instructed and I was toasty warm, my summit outfit consisting of 2 pairs of thermal leggings, walking trousers, waterproof trousers, 4 layers of thermal tops, a thick fleece, a down jacket, a waterproof jacket, 2 pairs of gloves, a fleece hat and a ski mask. But I’m not sure anything can fully prepare you for summit night! We start off ‘poley poley’ as ever. The moon is only one night short of full and the path is illuminated in front of us. Emmanuel and Frank don’t use head torches. However we’ve only been walking an hour or so when the queasiness sets in. This can be controlled fairly easily by continuous burping but Frank has to carry Alice’s backpack for her from early on. As we pass 5000m I start to feel light headed. I have a pocket full of sweets which I munch on continuously in an attempt to keep my blood sugar up (apparently it plummets drastically at extreme altitude). The further we go the more the yellow dots start to dance in front of my eyes to the point when I can hardly see the floor below me and with every step I feel as though I could pass out. Emmanuel doesn’t let us rest long, constantly calling “twende twende” (lets go, lets go), as the trail is extremely exposed to the wind and there are few places to shelter. Soon I too have to surrender my back pack to him to. The temperature drops to -15 degrees. The first things I lose feeling in are my hands, then my feet and face. It’s around this time that I start to compose the email in my head…the email explaining to everyone who had sponsored me that I didn’t make it to the top. It is only down to Emmanuel and Frank and the way they look after us that we manage to struggle on through the next few hours. Frank does up my shoes laces when my hands stop working because of the cold. They give us their walking poles and head torch when mine runs out, rub our hands to get the feeling back, get the water from my back pack (the only bottle that hasn’t frozen solid) and pour it in to our mouths. And all the while Emmanuel sings to us. Gradually my head starts to clear slightly. I think my brain can only concentrate on either the cold or the lack of oxygen but not both at the same time. We find our rhythm. We’ve been walking for 5 hours at this point but all I have is what feels like a few minutes of conscious memory. Just as I start to fear the mountain may be starting to get the better of me again, Emmanuel announces that we are nearing Stellar Point, where we join the crater rim. From there it is only 45 minutes to an hour to Uhuru Peak, the summit. The timing is perfect to give us hope. I know that if I can make it to Stellar point there’s no way I won’t make it to the summit, I’ll have come too far. However, Emmanuel may have been a little premature in his announcement as it feels another age before I look up from the floor to realise we are on the rim and Emmanuel is gathering us together for a group hug. It’s 5am. Up on the summit the temperature falls further to -20 degrees. It’s so cold that the boiled sweets I’m sucking won’t melt in my mouth anymore and I have to spit them out. As we follow the edge of the crater round there are dark shapes appearing all around us and icicles grow vertically up from the floor. Unlike the last 5 hours the last hour passes in a heartbeat as I anticipate the exhilaration of reaching the top. And all of a sudden we are there! We are some of the first to arrive. The Canadians have made it shortly before us and are doing press ups with their guide Living, I’m still not sure whether in celebration or to keep warm. It’s 6 am so we only have 15 minutes before sunrise and on the horizon a thin strip of red lights starts to stretch across the sky. My camera refuses to work at first and I have to stuff it down under all my jackets to warm up the battery. Slowly the dark shapes around us transform into 5 meter high glaciers. I read in my guide book that the glaciers have declined by up to 80% in the last 100 years due to global warming and deforestation on the lower slopes on the mountain. If they continue at the same rate they will be completely gone by 2020. 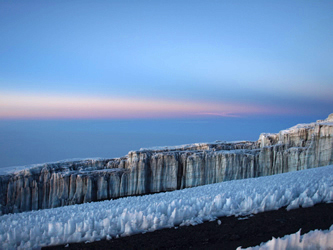 I’m glad to have seen the summit as Ernest Hemmingway described it in The Snows of Kilimanjaro, “as wide as all the world, great, high and unbelievably white in the sun”. With the light comes a feeling of great joy and achievement and another round of hugs. It also illuminates the precarious nature of our journey around the crater rim at times! I feel like I could stay on the top of the mountain forever. But it is still well below freezing and we have to keep moving. We begin the long descent down. If I didn’t know that only an hour or so earlier I had walked up the same path I never would have guessed. The mountain is thick dust that your feet sink down into. The Canadians half ski down it using their walking poles to keep upright. We see a few casualties along the way. There is one man who is being carried down by his group unable to support himself and we pass one woman crying on the path, as she can’t walk any further. All I have the energy to feel is relief that I made it. The sun becomes increasingly hot and slowly the feeling returns to my extremities in a flash of pins and needles, all except the fingers of my right hand, which stubbornly remain numb for the next week! When we finally arrive back at camp after 2 and half hours of heavy descent our porters congratulate us and bring us juice. We have 2 hours here to try and rest, eat some lunch and pack our tents. Alice is asleep within seconds but I am too excited. In the afternoon we walk steeply down for a further 5 hours, descending to 3100m. Its hard going especially for Alice whose big toe nails have gone black from the summit descent. We pass through each of the mountain zones we went through on the way up but in super quick rewind. Our camp for the evening is on the border between the rainforest and alpine zones. We eat a huge dinner of chicken and chips during which we rehash every moment of our summit successes with Alex and Matt. Their guides also had to carry their backpacks and therefore I don’t feel like quite so much of a girl. It also turns out Matt had to go for a rather inopportune toilet stop somewhere half way up the summit before taking a double dose of Imodium. Perhaps Alice and I got off lightly after all! By 7.30pm after 36 hours of being awake and over 17 hours of walking, I’m tucked up in my sleeping bag and enjoy the deepest and most content 11 hour sleep (largely helped by the fact that we no longer have to take the diamox). We wake early in an attempt to reach the gate before it gets busy. Today’s walk is 3- 4 hours down through the rain forest. Emmanuel wants to carry my baby today. I suspect it is a secret ploy of his to get us down quicker if I’m not stopping to take photos all the time! It is Pete’s camera so I am apprehensive about letting it go but Emmanuel promises me that it is now his baby to and he will look after it so I reluctantly hand it over. It turns out what Emmanuel actually wants is to take photos himself! I show him how to use some of the setting on our way down. As we drop steeply down we pass through the cloud. The mist creeps in through the trees, which are densely twisted together. Along the path there are trees growing on either side, which then join together above your head, tangling into one indistinguishable trunk. As the cloud gets thicker around us, it gets increasingly wet, until before we know it it’s actually raining. After seven gloriously sunny days of carrying our waterproof trousers in our daypacks, on the day it decides to rain of course Alice’s and my waterproofs are packed into our tent bags, which are happily being carried along by the porters on a different part of the trail! We don’t really mind, not much could dent our spirits today. The path becomes extremely slippy and we make slow progress until we take a leaf out of the porter’s book as they come whizzing past us as break neck speeds. We discover that strangely the faster you go the easier it is and we finish the trek in a blurry, slipping, sliding mud slalom. We are picked up by the jeep at Mweka village. It is only 45 minutes back to the hotel and we drive past coffee and banana plantations, Moshi hospital (one of only 3 large hospitals in the country) and numerous school children who wave excitedly as we pass. Back at the hotel we get a Kilimanjaro beer (which goes down far too swiftly) and Emmanuel awards us with our certificates from the national park. It feels strange to be off the mountain. It’s astonishing how quickly you adapt to a new environment and way of life. To me, being dirty, living in a tent and eating the breakfast porridge now just seems the norm and it is the hotel and its comfy beds, hot showers and sunbathing guests which seem unreal. Even more astonishing is the speed at which you form bonds and start to care about the people on the mountain with you, the Canadians, Emmanuel and Frank, the young porter who calls us for dinner each evening and everyone who helped us get to the top. Whilst I am glad I am back safely, I’m also a little sad that it is over and that I won’t see Emmanuel’s smiling face or hear him sing to us anymore or wake to a view of snow capped Kibo each morning. I’ve loved every second of our journey. Three days later, after our safari, I am back at the hotel to catch my transfer to the airport. Alice’s boyfriend Richard has flown out to meet her and they are heading on to Zanzibar so I am alone. Previously Kilimanjaro has been hidden from us when down in Moshi due to low cloud and heat haze. But as the bus rumbles through the town I look up to see the summit of Kilimanjaro towering high above me, giving me one last wave goodbye. So now the adventure is over and I reflect on it all. We’ve been through a lot, wind, rain, glaring heat and dust storms. There have been tears (me secretly at the top), singing and a lot of laughter. We are filthy, bedraggled and greasy (Matt’s hair almost made Alice vomit on one of the days she wasn’t feeling well). There have been the inevitable toilet issues along with nosebleeds, black toenails, sunburn and an awful lot of snot. It is impossible to hang on to much dignity when walking Kilimanjaro. But as Alex so rightly put it at our last meal together, you regain it all and more when you reach to the top. To see all of Hannah’s photos please visit our Flickr site. This entry was posted in Fund-raising on November 5, 2010 by nyodema. Following the success of ‘Nyodema by the Sea’ back in June, where we raised enough money to finish the first classroom in Dairuharu, The Gambia, we couldn’t resist hosting another event on the August bank holiday weekend with an exciting variety of music from around the world from Bognor Regis to Africa! Headliners Bristol based band ‘Baraka’ take their inspiration from the music of West Africa, South Africa, The Caribbean and Ireland, producing their own unique and original sound. The result is a heady mix of global beats, intricate rhythms and soaring melodies. Baraka are a wonderful example of world music at its’ best with Ben Baddoo from Ghana on percussion and balafon, Paul Bradley on guitar and Mark Bradley on drums both from Northern Ireland, Dominican, Royston Gage on bass, Brendan Whitmore from Southern Ireland on sax and the outstanding Senegalese kora and djembe player, Modou Cissoko. 5pm The Fabulous Tomato Bros. There will also be African drumming workshops with Chris Diallo at 1.00pm (Childrens workshop, adults welcome) and 2.30pm (over 15s only please suitable, for beginners and more experienced drummers alike). Chris is an outstanding teacher with many years of experience having studied percussion extensively throughout West Africa. Places are limited so please book in advance by emailing: nyodemao7@yahoo.co.uk or call 07974 472137 (£5 donation please, £3 for under 15s). The festival opened at noon with Nyodema’s choir accompanied by the Nyodema Drummers with songs from across Africa. Some outstanding solos, in particular from Binky Slade, were a real treat for those who arrived or the start of the festival. Next on was, Bella, a talented young guitarist, singer and composer. She has been playing guitar for nearly 10 years. Her album of solo guitar works released in 2009, ‘Paint Your Sound’, is an exploration into using the guitar as an illustrative tool, stretching the instrument further than conventional uses, bringing out subtle, hidden textures. Other artists included David Farnan (from Dakota VI), McMurdo Sound, singer/songwriter Marie Derouard and The Matt Argyle Band, a local group mixing vocals, guitars, viola and flute for their original blend of folk/roots Americana. The band played an acoustic set from their own album “Exhale”, as well as some laid back covers for a sunny August afternoon. The verandah stage closed with The Fabulous Tomato Bros. who have played a variety of venues from HMS Victory to the Ritz Hotel in London and festivals from Bude to Ratvik in Sweden. Whilst residents in the infamous Blue Coconut Club for fifteen years they played alongside the likes of Ralph McTell, Julie Felix, Tom Paxton, Arthur Brown, Richard O’Brien and DJ Mike Reid. Their music is an eclectic mix of acoustic based Irish, Country, Jazz and Sixties and Seventies pop/rock. At 6pm the music moved inside for the unique sonic grooves of SpaceBaby. The band celebrated their tenth year of existence, performing at festivals around the UK. There have been many talented local musicians who have performed with SpaceBaby over the decade, the lineup for Bognor to Banjul includes, Lem Parker on vocals (the Mulatones), Keith Sutton on synths and guitar (the Poopahs), Mike Fry on bass (the Wah Wahs) and Duncan Burgess on drums (the Doppler Shift). 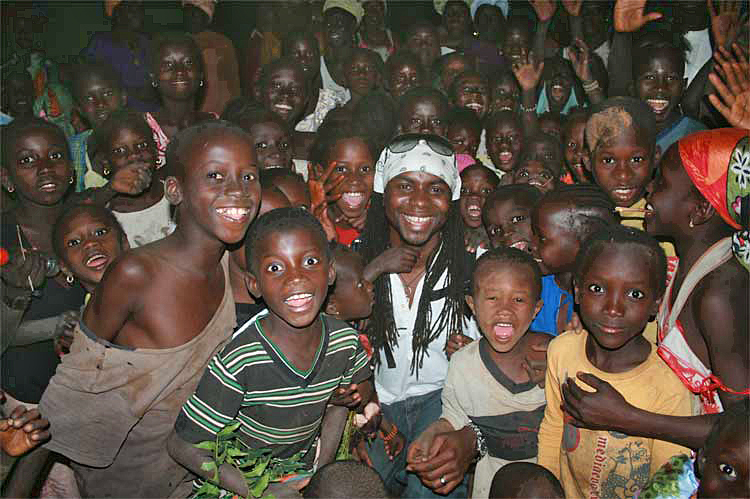 This entry was posted in Festivals, Fund-raising, World Music & Arts events on August 12, 2010 by nyodema. 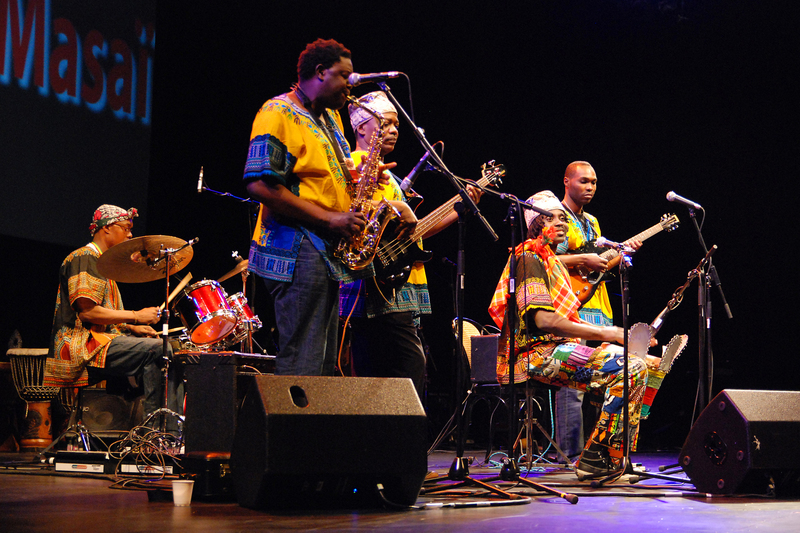 This FREE all day event was a celebration of world music and arts by the Sussex seaside. Live music, drum and dance workshops, craft stalls, African food and much, much more. To see photographs of the day please visit our Flickr site by clicking here. 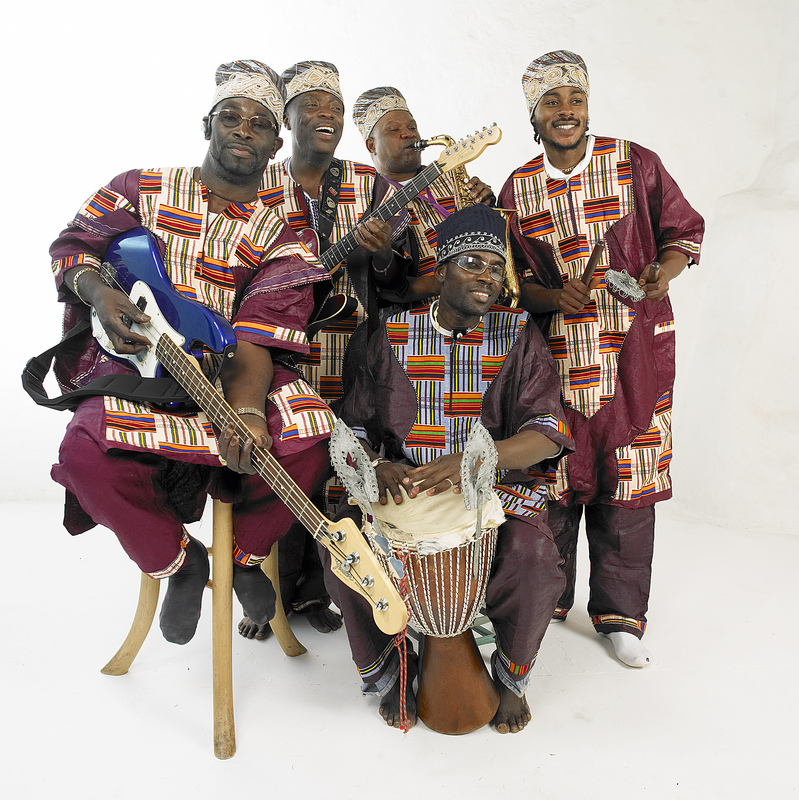 Joint headliners, Kasaï Masaï, brought the traditional sounds of remote African villages with an urban twist to the Sussex coast. Kasaï Masaï biography. Plus the charismatic, Magnet Man from Barbados. Visit Magnet Man’s website here. The day also featured performances from talented trio, Sixfifteen, with their infectious mix of progressive bluegrass and jazz, the unique, 4-part harmony, acoustic based group Dakota VI, the exciting latin jazz/afro beat sounds of the Mulatones, roots blues guitarist Simon Stephens, The Nyodema Drummers featuring Chris Diallo and the Nyodema Community Gospel Choir. PLUS African drumming workshops with Chris Diallo from Hands on Skin and flamenco/belly dancing workshops with Morgana Villen who also did a number of performances throughout the afternoon. While this is a free event everyone had the opportuniy to make a donation to Nyodema’s Gambian school projects including re-building a school in Dairuharu, Brikama, The Gambia. Nyodema would like to thank the sponsors of ‘Nyodema by the Sea’ Grass Roots Grants, Youngs Brewery, The Gambia Experience and MAGNETIC IMAGE RECORDS, Bridgetown, Barbados plus Carl and all the staff at The Waverleywho were fantastic. This entry was posted in Festivals, Fund-raising, Gigs, Workshops, World Music & Arts events and tagged Africa, belly dancing, Choir, Chris Diallo, Congo, Dakota VI, Drumming, Events, Festival, flamenco, Gospel, Hands on Skin, Kasai Masai, Magnet Man, Morgana Villen, Mulatones, Sixfifteen, Workshops, World Music on March 11, 2010 by nyodema. 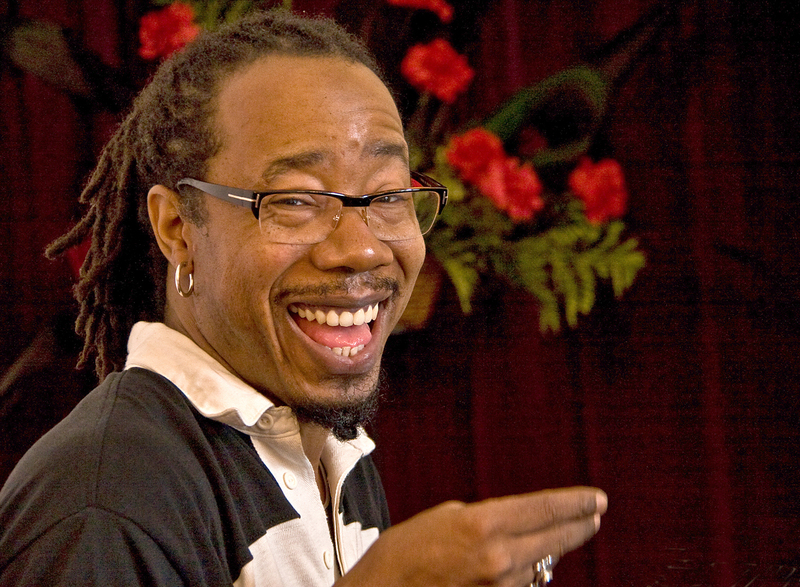 Gospel singing legend, Daniel Thomas, returns to Bognor Regis for a one day workshop on Saturday 20th February. led by the artistes themselves! Following the success of last year, world class vocal coach Daniel Thomas is set to return to Bognor for a one day Gospel singing masterclass. The former Choral Director for the London Community Gospel Choir has had an enviable career, from performing to audiences which include Nelson Mandela and Prince Charles, appearing in West End Musical Godspell to coaching popstars including Girls Aloud, Javine and Michelle Gayle, to name but a few. The Gospel Choir Workshop which took place for the first time in May 2009 is organised by British Gospel Arts and the local charity, Nyodema, who combine their passion for world music with their commitment to fighting poverty in The Gambia, West Africa. The workshop will take place at the Regis School of Music in Sudley Road, Bognor from 11a.m. – 4.30p.m, followed by a showcase where the choir can demonstrate their new Gospel talents. Everyone is welcome to participate, whether you are an experienced singer or complete novice. Not only will you be trained in new skills by the best in his field, you will also have fun, make friends and raise money for a very worthy cause! Click here to read about Daniel’s workshop last year. This entry was posted in Fund-raising, Workshops, World Music & Arts events on February 7, 2010 by nyodema. Thanks to Renishaw plc based in Gloucester for sponsoring four desks and sixteen benches and to the Di Marcos for overseeing the purchase. The remaining desks needed at this school will be ordered in 2010 by Nyodema. This entry was posted in Fund-raising, Health and Education Projects in The Gambia on January 27, 2010 by nyodema.